●Grilled Chicken Pesto Baguette, grilled chicken, mozzarella cheese, mixed greens, tomato and pesto mayonnaise drizzled with balsamic dressing on a toasted baguette. ●Smoked Salmon Baguette, smoked salmon, mixed greens, cucumbers, red onion and dill cream cheese on a toasted baguette. 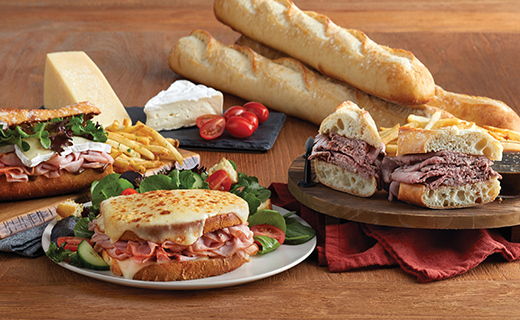 ●Parisian Ham Baguette, thinly-sliced smoked ham, brie cheese, mixed greens and fig mustard on a toasted baguette. ●Turkey Hummus Sandwich, slow-roasted turkey, hummus, baby spinach, tomato, cucumbers, crumbled feta cheese and balsamic dressing on toasted whole wheat bread. ●Croque Monsieur, thinly-sliced smoked ham and swiss cheese served warm on toasted sourdough topped with mornay sauce and melted parmesan cheese. ●Chicken & Quinoa Mediterranean Salad, pulled roasted chicken, tomatoes, cucumbers, artichoke hearts, onions, olives and quinoa on romaine lettuce and kale tossed in red wine shallot vinaigrette. ●Berry Spinach & Shrimp Quinoa Salad, two skewers of grilled shrimp, fresh strawberries, blueberries, crumbled feta cheese and quinoa on baby spinach tossed in fat-free raspberry vinaigrette. ●Creamy Chicken & Mushroom Pasta, grilled chicken and mushrooms with linguine pasta tossed in a creamy mustard sauce. ●Crème Caramel, a rich and silky custard topped with caramel sauce. ●Classique Cheesecake, velvety cheesecake with a graham cracker crumb crust. Served with strawberry purée and a fresh strawberry. ●Triple Berry Crumble, warm berry crumb cake topped with a scoop of vanilla ice cream.